Opposite the Temple of Harmony and sitting in a high position on the southern bank of Mill Wood’s final pond is a stone-faced bridge of three arches. Built between 1756 and 1771 when the northern most end of Mill Wood, along with the temple itself, were added to the earlier phase of the landscape, the bridge straddles the water below at a particularly interesting visual stop. 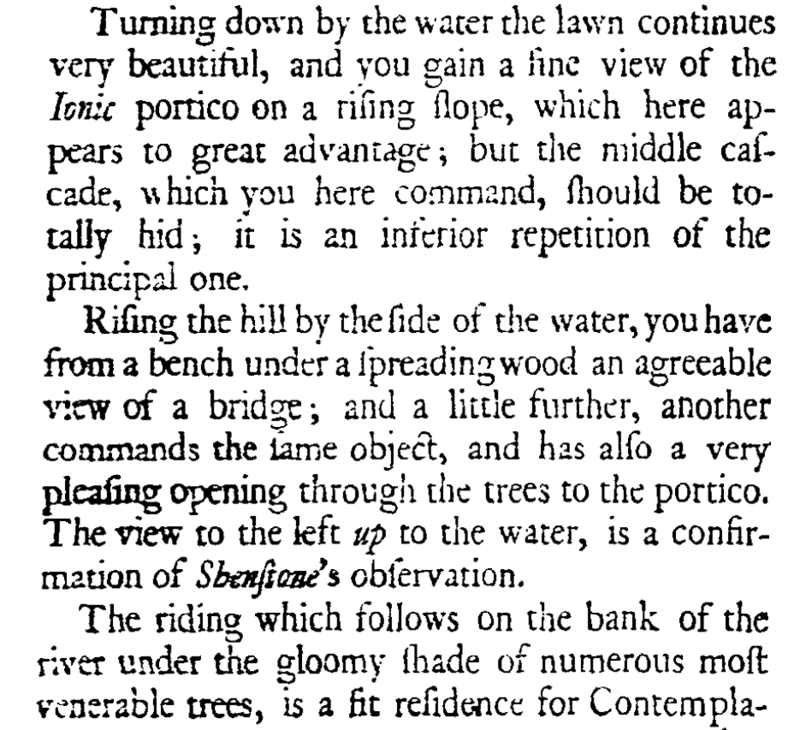 Unlike many of the original room-like eighteenth-century spaces created within this landscape the bridge was intended to have clear sightlines in all four directions. Standing on the bridge the four views include the Temple of Harmony to the west, the Rotunda to the east, the flow of the ponds to the north and to the south, noisily cascading over a mossy and rusticated rockery below, is the water that finally rests in a large still pond, these days with an island at its centre. When on a high point near the bridge in Mill Wood Young caught sight of water in a pond further up the hill, which he felt was ‘a confirmation of Shenstone’s observation’ and also commented that the cascade beneath the bridge was a repetition of the larger water cascade at ‘Neptune’s Arch’ in the centre of Mill Wood. 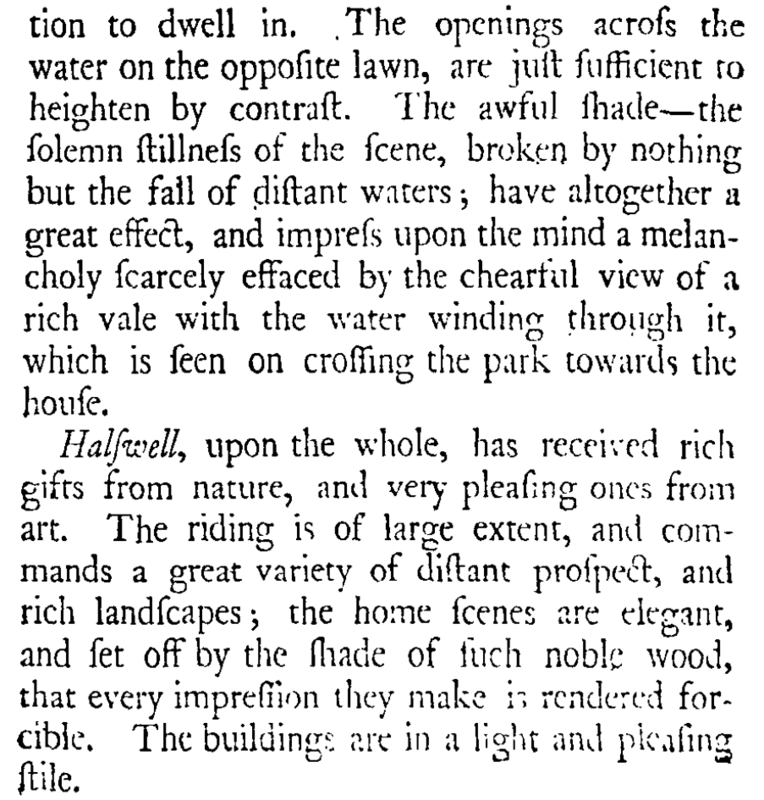 At this, his otherwise glowing appreciation for the layout of the ponds took on a markedly different tone. This seems a little harsh, misguided even, given the waterfall landscape by necessity has pools of water on multiple levels. However his comments give an interesting glimpse into the competetivly aesthetic world Sir Charles Kemeys-Tynte inhabited. The friendly rivalry between the ‘THREE GENTLEMEN OF ARCADIA’ (click to view full dissertation), discussed in Sue Sheppard’s 2003 Bath University dissertation of that name, was fierce. These three contemporaries, Henry Hoare III (1705-1785) of Stourhead, Coplestone Warre Bampfylde (1720-1791) of Hestercombe and Sir Charles Kemeys-Tynte (1710-1785) of Halswell all exchanged ideas and comments but they also vied for gardening prominence throughout the eighteenth century. The levels of landscape discourse shared between them is well covered in Ms Sheppard’s work and through the correspondence left by these three men. Commentators such as Shenstone and to a lesser extent Young were poised to bite if they felt the arcadian landscapes these men were creating were not following the rules of taste that were being created by the aesthetes of the day. The Temple bridge itself is a much larger and complex structure than the simple crossing it might seem. The three arches are segmental in curve, a very eighteenth-century design. Though the Romans did come up with this, realising as arch does not need to be completely semicircular to be supportive, it is not until the eighteenth century that we really see this being used again. The bridge appears to be of Bath Stone, like the impressive dam-bridge further along the landscape, but it is in fact constructed in redbrick and has vast piles of stepped redbrick underneath its arches, each of which creates a noisey cascade for the flowing water. They naturally cover over with mosses and foliage to create a more natural feeling waterfall. Below and alongside these mossy steps are large pieces of carved rusticated stone, each piece carved to look like part of a water system that has eroding away under the pressure of water flowing for hundreds of years. These were carefully placed to create the greatest impact for the water that flowed through the landscape. They were also imbedded into the bank to make the bridge feel as though it was built upon an ancient waterway, when in fact this section of damming and rusticated stone were no later than the bridge above them. As can be seen in the following drawings and photos these pieces of stone are now strewn about and no longer function as they were intended. Interestingly, now that the stones are displaced, earlier carved stone can be seen protruding through the mud. Sixteenth or seventeenth-century stone mullions from some of the many phases of rebuilding at Halswell were used as rubble in the bridge’s construction. We have seen this before at Halswell, the bridge above the Rockwork Screen near the Rotunda was also made using rubble from the late seventeenth-century banqueting house that used to sit on the site where the Rotunda was built in the 1750’s. The bridge itself has a brick walking surface and once had steel railings to either side. Some remnants of these original railings are still onsite, with thick tree growth wrapping around their bars. The post-holes the railings fitted into are visible all along the top of the bridge and by using this existing evidence it will be possible to replace the railings as they once were. The structure of the bridge has been slightly twisted by large trees growing at each end. These unwanted invaders have been removed and the structural integrity of the bridge accessed, surprisingly it is still sound. This might in part be due to a concrete weir that was placed immediately to the south of the bridge, sometime in the earlier part of the twentieth century. 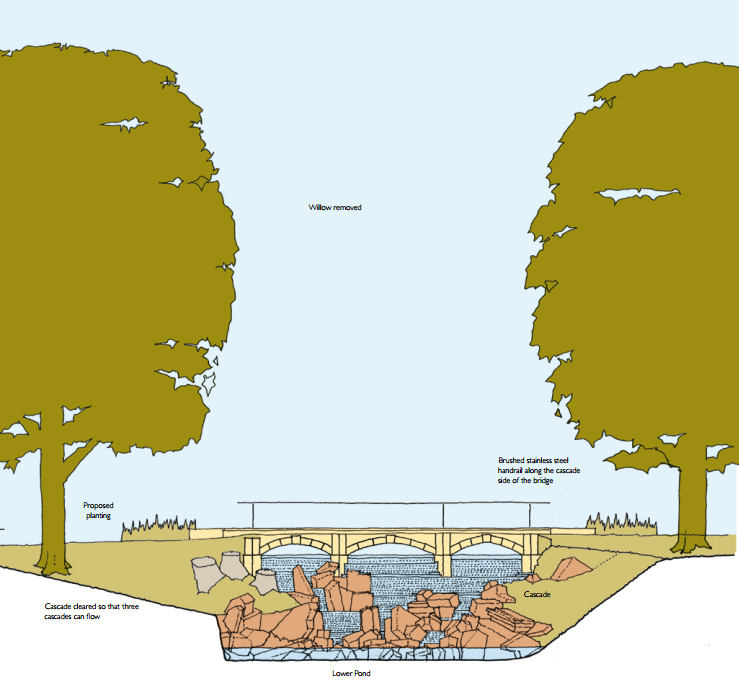 Its inclusion has created a larger pond than previously intended but also saved the bridge from likely destruction through neglect in the later twentieth century. The Temple Bridge is one of the many individual restoration projects that are now being comprehensively accessed for undertaking during the complete restoration of Mill Wood.